In a warehouse large enough to hide the Ark of the Covenant, a forklift headed directly toward Baltimore Archbishop William E. Lori, passing opportunities to turn off before coming to a halt. A goateed, youngish man with cropped hair and tactical boots jumped out with a mile-wide smile and enthusiastically pumped the archbishop’s hand. Meeting Jeff, a graduate of Catholic Charities Christopher Place Employment Academy and now a forklift operator at the Maryland Food Bank, was an early highlight of the archbishop’s Aug. 17 tour of the massive facility on Halethorpe Farms Road. 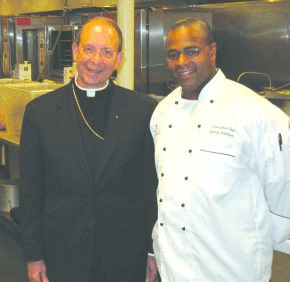 “I’ve always known about the Maryland Food Bank, but to see the operation is wonderful,” Archbishop Lori said. The food bank distributes more than 100,000 meals every day to children and families in need with the help of more than 1,000 distribution partners, many of which are organizations, parishes and schools of the Archdiocese of Baltimore. Archbishop Lori’s visit came nearly four months after the April 27 unrest that followed Freddie Gray’s death. In the wake, West Baltimore parishes have increased their food distribution programs. “We always were present in the neighborhoods, but with convenience stores being down and just the need increasing, we’ve stepped up a lot of feeding and providing food, especially in parish food pantries, in cooperation with Catholic Charities,” the archbishop said. According to William J. McCarthy Jr., the organization’s executive director, Catholic Charities particularly sought to support pantries at St. Gregory the Great, St. Peter Claver and St. Edward, all in West Baltimore. Catholic Charities has entered into an agreement to purchase food from Maryland Food Bank at a discount “to ensure there is consistent delivery to those (West Baltimore) parishes on a consistent basis,” McCarthy said. The archdiocese is also a source of food for the food bank. Through a partnership with First Fruits Farm, a Freeland-based Christian nonprofit that grows food for the hungry, the archdiocese is currently farming more than 70 acres in Baltimore County, up from about 25 acres the previous two years. According to William Baird III, CFO and executive director of management services for the archdiocese, the food grown – more than 400,000 pounds for each of the two previous years – goes to the Maryland Food Bank, Catholic Charities’ Our Daily Bread, and other food banks near Washington, D.C., and Pennsylvania. Archbishop Lori’s tour of the Maryland Food Bank wound through massive storage facilities, stopped to observe volunteers sorting donated food, and visited the kitchen, where staff cook meals for distribution and teach others to cook. Manny Robinson, executive chef of the food bank, spoke about the food bank’s FoodWorks program, in which low-income adults learn “close to two years’ worth” of culinary skills in a 12-week, intensive program that includes job placement assistance.